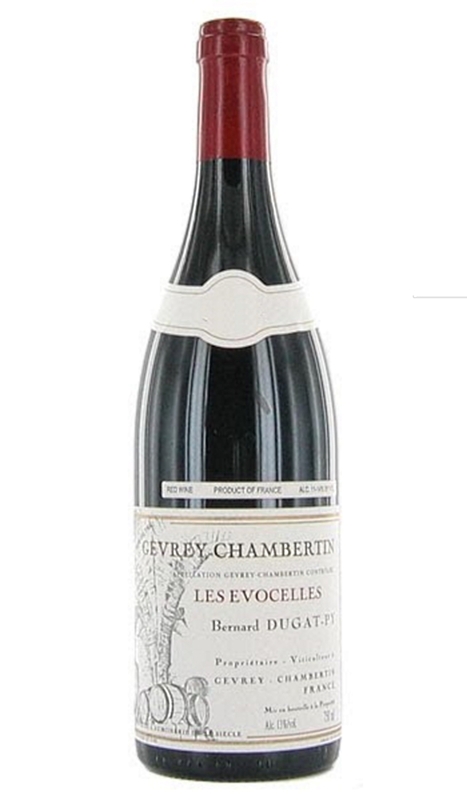 The 2016 Gevrey-Chambertin Les Evocelles is a stunning young wine, unfurling in the glass with notes of violets, rose petals, griotte cherries, wild berries and subtly savory nuances of forest floor and smoke. On the palate, the wine is medium to full-bodied, deep and multidimensional, with a vibrant line of acidity, an immensely layered mid-palate that conceals a chassis of velvety structuring tannin, and incredible length on the precise, mineral finish. To my mind, this cool and stony hillside site in Brochon is a de facto premier cru, and it always produces a finer, more tensile wine than the fleshier, heartier renditions of Gevrey that emerge the terroirs that sit in the villages alluvial fan. While my drinking window reflects my sense of the optimal time to pull corks, readers looking for an insight into the direction being taken by the Domaine Dugat-Py could do worse than try a bottle in its infancy. "La Revue du Vin de France" has rated the wine "Domaine Dugat-Py Gevrey-Chambertin Les Evocelles, Cote de Nuits, France" from the vintage 2014 on 01.01.1970 with 16 of 20 points. "Vinous Antonio Galloni" has rated the wine "Domaine Dugat-Py Gevrey-Chambertin Les Evocelles, Cote de Nuits, France" from the vintage 2014 on 01.01.1970 with 88 - 91 of 100 points. "La Revue du Vin de France" has rated the wine "Domaine Dugat-Py Gevrey-Chambertin Les Evocelles, Cote de Nuits, France" from the vintage 2013 on 01.01.1970 with 17 of 20 points. "Vinous Antonio Galloni" has rated the wine "Domaine Dugat-Py Gevrey-Chambertin Les Evocelles, Cote de Nuits, France" from the vintage 2013 on 01.01.1970 with 90 - 92 of 100 points. "La Revue du Vin de France" has rated the wine "Domaine Dugat-Py Gevrey-Chambertin Les Evocelles, Cote de Nuits, France" from the vintage 2012 on 01.01.1970 with 15 of 20 points. "Vinous Antonio Galloni" has rated the wine "Domaine Dugat-Py Gevrey-Chambertin Les Evocelles, Cote de Nuits, France" from the vintage 2012 on 01.01.1970 with 89 - 92 of 100 points. "La Revue du Vin de France" has rated the wine "Domaine Dugat-Py Gevrey-Chambertin Les Evocelles, Cote de Nuits, France" from the vintage 2011 on 01.01.1970 with 15 of 20 points. "La Revue du Vin de France" has rated the wine "Domaine Dugat-Py Gevrey-Chambertin Les Evocelles, Cote de Nuits, France" from the vintage 2010 on 01.01.1970 with 15 of 20 points. "Gault & Millau" has rated the wine "Domaine Dugat-Py Gevrey-Chambertin Les Evocelles, Cote de Nuits, France" from the vintage 2009 on 01.01.1970 with 17 of 20 points. "La Revue du Vin de France" has rated the wine "Domaine Dugat-Py Gevrey-Chambertin Les Evocelles, Cote de Nuits, France" from the vintage 2009 on 01.01.1970 with 16 of 20 points. "Gault & Millau" has rated the wine "Domaine Dugat-Py Gevrey-Chambertin Les Evocelles, Cote de Nuits, France" from the vintage 2008 on 01.01.1970 with 18 of 20 points. "La Revue du Vin de France" has rated the wine "Domaine Dugat-Py Gevrey-Chambertin Les Evocelles, Cote de Nuits, France" from the vintage 2008 on 01.01.1970 with 16 of 20 points. "Gault & Millau" has rated the wine "Domaine Dugat-Py Gevrey-Chambertin Les Evocelles, Cote de Nuits, France" from the vintage 2007 on 01.01.1970 with 18 of 20 points. "La Revue du Vin de France" has rated the wine "Domaine Dugat-Py Gevrey-Chambertin Les Evocelles, Cote de Nuits, France" from the vintage 2007 on 01.01.1970 with 16 of 20 points. "Vinous Antonio Galloni" has rated the wine "Domaine Dugat-Py Gevrey-Chambertin Les Evocelles, Cote de Nuits, France" from the vintage 2007 on 01.01.1970 with 89 - 92 of 100 points. "La Revue du Vin de France" has rated the wine "Domaine Dugat-Py Gevrey-Chambertin Les Evocelles, Cote de Nuits, France" from the vintage 2006 on 01.01.1970 with 16 of 20 points. "Vinous Antonio Galloni" has rated the wine "Domaine Dugat-Py Gevrey-Chambertin Les Evocelles, Cote de Nuits, France" from the vintage 2006 on 01.01.1970 with 89 - 91 of 100 points. "Gault & Millau" has rated the wine "Domaine Dugat-Py Gevrey-Chambertin Les Evocelles, Cote de Nuits, France" from the vintage 2005 on 01.01.1970 with 19 of 20 points. "La Revue du Vin de France" has rated the wine "Domaine Dugat-Py Gevrey-Chambertin Les Evocelles, Cote de Nuits, France" from the vintage 2005 on 01.01.1970 with 16 of 20 points. "Vinous Antonio Galloni" has rated the wine "Domaine Dugat-Py Gevrey-Chambertin Les Evocelles, Cote de Nuits, France" from the vintage 2005 on 01.01.1970 with 89 - 91 of 100 points. "La Revue du Vin de France" has rated the wine "Domaine Dugat-Py Gevrey-Chambertin Les Evocelles, Cote de Nuits, France" from the vintage 2002 on 01.01.1970 with 19 of 20 points. "La Revue du Vin de France" has rated the wine "Domaine Dugat-Py Gevrey-Chambertin Les Evocelles, Cote de Nuits, France" from the vintage 2001 on 01.01.1970 with 18 of 20 points. "La Revue du Vin de France" has rated the wine "Domaine Dugat-Py Gevrey-Chambertin Les Evocelles, Cote de Nuits, France" from the vintage 2000 on 01.01.1970 with 18 of 20 points.